A novel by a young Russian-from-Azerbaijan woman, originally written in German, about an immigrant experience in Europe and the Middle East is unlikely to get a lot of attention in America, as the statistics about novels-in-translation show. 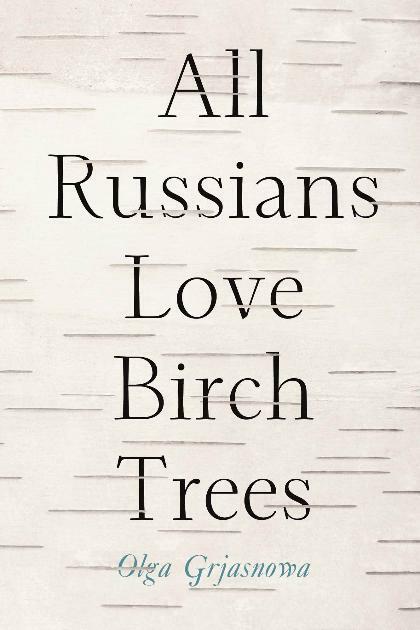 Perhaps it would help, if I compared this one, All Russians Love Birch Trees, by Olga Grjasnowa, to an inverted Nabokov—young, Jewish, female and dispossessed, but also brilliant, and writing about exile and home. The story starts with a moment of cultural disorientation, a couple asleep in a city apartment, but it’s not clear from the sounds (“the laughter of the fruit vendor and the rattle of the streetcar”) and the signifiers (a central station, “a left-leaning youth center, whose visitors often mistook our front door for a urinal”, sunflower shells) or the weather (hot) where they are. The title leads the reader to expect Moscow, but the details aren’t right. Things start happening, in strangely fine-grained detail, a beautiful technique, one of many the writer uses to mimic memory. “We stayed there, wedged together, until someone else’s alarm clock went off behind the wall and my hand grew numb beneath his weight. When it went completely numb I climbed out of bed to take a shower.” And it takes quite a while for these particulars to coalesce. Who are these people? What city are they in? What is their ethnicity? The first anchor I found was that Masha, the narrator, was a young, attractive Russian woman who fell into a volatile type I’ve met in life, if not in literature, angry young women who seem to be suffering from some long-hidden damage. And that was before things started to go wrong. We eventually figure out that she’s a Russian Jew by way of Azerbaijan, who emigrated to Germany during the Azeri-Armenian war, and hangs out with other immigrants, some Turkish, some Kurdish. The conflict in Azerbaijan—one of those obscure Soviet-breakup ones that few Americans have heard of—was violent and ugly, and though Masha is young, she’s been through a lot. Her anger is warranted. When the story starts Masha is studying to be an interpreter–as between language as she is between cultures–and has a German boyfriend who she’s in love with. As events unfold everything in her life changes, and she’s forced to confront, or try to run away from, the deep grief of her past. I don’t want to spoil the plot, so will just say that the events were page-turning, as was the portrait of young, educated, pissed-off immigrant life in Germany and later Tel Aviv. I also especially loved the style and narrative command of the storytelling. The book doles out information about Masha’s past with true mastery, and cuts sharply in and out of disparate scenes, sometimes in the same chapter, with only paragraph breaks. The voice also pulls in and out, from overview to extremely granular detail in a beautiful way that feels like memory, or how an identity is constructed. Nothing was mannered, but the style felt fresh. I don’t think the narrator loves birch trees, though we never find out.